RESOLVED, that the ELCA commit itself to finding a way for people in such publicly accountable, lifelong, monogamous, same-gender relationships to serve as rostered leaders of this church. The vote was approximately 60% for. Due to the press of other obligation, I’ve not gotten around to making some of the posts I have been meaning to write. My post “No Anglican Covenant” really requires some follow-up explaining why I believe an Anglican covenant is a bad idea in principle. Look for some activity on this front soon. While I was thinking about the Anglican covenant, Bishop Mark Lawrence of South Carolina published his address to the clergy of his diocese. This definitely requires a response. Recall that, soon after Lawrence was elected the first time, I wrote an essay opposing his consecration. I suggested that Lawrence would subvert The Episcopal Church. After a failed attempt to achieve the required consents, he was elected a second time by his diocese. This time he reassured Episcopalians in more convincing words that he would not be a subversive bishop. His reassurances were sufficient to guarantee his consecration. One now has to question the sincerity of Lawrence’s declarations of loyalty to his church. He his sounding a lot like Bob Duncan in September 2003, and we know how that ended! Various diversions have kept me from fully engaging either of the foregoing projects, not the least of which was my visit to the emergency room of St. Clair Hospital because I was experiencing chest pains. Happily, that turned up only a minor problem from a medical standpoint, and my life is back to what passes for normal. Another diversion has been more creative. I just finished a poem titled “I Was a Proud Southern Christian,” an autobiographical piece about my spiritual odyssey. (Notice the tense of the verb in the title.) Anyway, the poem may be of interest to Episcopalian readers. And as long as I’m plugging a poem, I should mention another church-related poem from earlier in the summer. Christopher Wilkins, a former vice president of Progressive Episcopalians of Pittsburgh and very good friend, was ordained in June. For the occasion, I wrote “Christopher Becomes a Deacon.” Christopher escaped a crazy diocese and joined a sane one, one in which a non-conservative could be ordained. Of course, the Diocese of Pittsburgh is now returning to sanity. Thanks be to God. Anyway, stay tuned for more essays on things Episcopal. 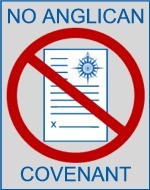 Meanwhile, look for the “No Anglican Covenant” logo, which is now gracing a number of blogs. Does your blog need one? I have never thought that an Anglican covenant was a good idea. Although some ground rules about how Anglican churches should behave toward one another would be welcome—see “The Covenant We Do Need”—“covenant” is really too grandiose a term for such an agreement. In reality, the push for a covenant is about stopping theological development within the Anglican world and, should progress rear its ugly head, to punish the purveyors of it. Of course, The Episcopal Church is the most obvious candidate for discipline, but other sacrificial lambs await on the horizon. I am hopeful that the recent General Convention resolutions and what may be a new militancy within the Church of England will help make approval of any covenant by Western churches less likely than it had seemed only a few weeks ago. Having spent far too much time writing my response to Archbishop Rowan Williams, I am not yet ready to write the definitive denunciation of the Anglican covenant process. I am, however, ready to suggest that Episcopalians and other moderate and progressive Anglicans must begin now a campaign against any Anglican covenant, lest our churches approve whatever comes along out of simple but misguided Anglican civility. As a tool for the resistance, I offer the anti-covenant logo displayed above. I do not claim to be a graphic artist, and therefore realize that others may be able to devise a more exciting logo for the campaign. There is, however, something to be said for simplicity. 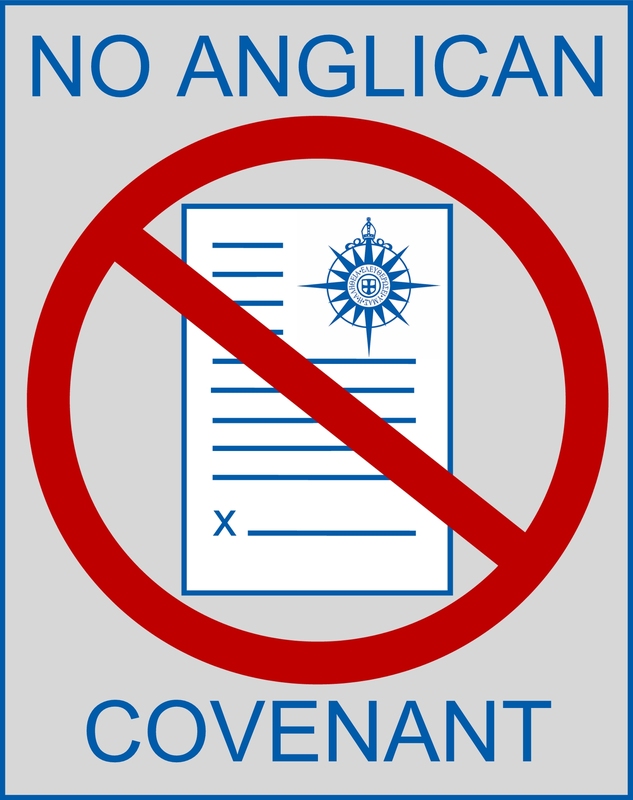 I invite others to use the No Anglican Covenant logo to show your opposition to the dangerous innovation that is the Anglican covenant. 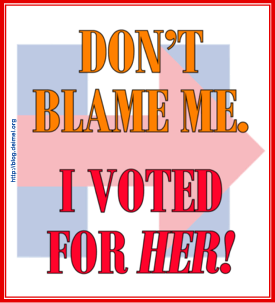 Because I realize that my graphic may not be suitable for all occasions, I offer a larger version of it here, from which you can generate your own appropriately sized graphic for the Web or for paper documents. Update, 10/8/2010: For additional versions of the No Anglican Covenant logo and information about using it in other contexts, click here.